Take a Flier - What Does It Mean? What does it mean to "take a flier"? 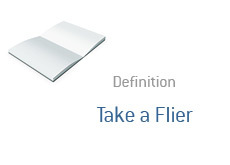 What is the definition of "taking a flier"? "Taking a flier" means investing in any asset in which you know that there is a high probability that you may lose most or all of your investment. "Taking a flier" means that you are using money to invest that you are ok with losing. By "taking a flier" in something, you are investing in a high-risk, potentially high-reward asset. Example 1. A friend of yours calls you up and recommends that you invest in a penny stock called XYZ. He warns that this is a high-risk investment, but that the company is working on some sort of new technological breakthrough that could revolutionize the industry that is operates in. You just received your tax refund for the year and don't really need the money, so you decide to "take a flier" and invest $1,000 in the stock. If it goes up, great. If it drops to $0, that's fine too. Example 2. You head to a local swap meet, where you meet somebody that is selling three cardboard boxes full of old baseball cards. You know nothing about baseball or baseball cards, but decide to "take a flier" and shell out the $100 for the three boxes, hoping that there is something of value buried deep within one of the boxes. You can certainly live without the $100 if the cards end up being worthless, but you decide to buy anyways, hoping that there is something of value buried within.